So I'm going to just skip over all that and talk about what my own plant, and the identical ones at work, seem to like, and if somebody has a problem with that then we can just take this outside and settle this like childish men. Care information: this is an easy plant to keep alive, but it's a pain to keep it looking nice. Light is the main difficulty I have with mine (or the ones at work, for that matter): too little, and the stems get weak and elongated, but too much, and the leaves bleach out. They do self-branch, a bit, though if you want a presentable, bushy plant, you have to pinch back the tips occasionally. They also seem to be pretty heavy feeders, but that's sort of to be expected for a plant that grows as fast as it does. None of these are enormous problems, and there are a number of good points, too: overwatering and underwatering are taken in stride (though watering when the soil is about halfway dry, or a little drier, seems to be about ideal), it isn't particularly prone to pests, and humidity and temperature seem to be non-issues as far as I've seen. Plus it propagates easier than almost anything – root it in soil, root it in water, root it in dirty socks (haven't tried it, but I bet you $5 it would work: just, you know, keep the socks damp but not soaked, and send me a picture). This is useful in a few ways: one, you can always give away cuttings if somebody asks, secure in the knowledge that you can easily get more where that came from, and two, if you get tired of a particular plant that isn't looking great, starting it over takes about three minutes and a glass of water. You can also fill in empty spots in a plant pretty easily, just by taking a cutting, making a hole in the soil, and sticking the cutting in the hole: this won't work out every time, but it will work often enough. If you're adding cuttings to an existing pot, you shouldn't have any worries about the soil. If you're trying to start a new plant entirely, in most cases you still won't have to be concerned about soil, but make sure it's not something that's going to be really heavy and wet, because too much water will cause the cuttings to fail. Plectranthus verticillatus seems to be one of the old standard plants, though it's not often sold in stores: it's one of those like Tradescantia zebrina (wandering Jew) that gets passed around from person to person and generation to generation without ever really seeing retail.3 We sell it at work, and it's not a big mover, though hanging baskets do well if they're full. Unfortunately, the hanging baskets I started in the early fall have gotten way too much light, and are kind of a sickly yellowish color. I'm hoping that if I move them to a darker spot, the leaves will green up, but even if the old leaves don't get darker, the new growth should be normal. It'll fix itself one way or the other. For reasons which aren't entirely clear to me, my variegated plants have not done nearly as well as I was expecting. I think a lot of my problem is just that I didn't plant a lot of cuttings together in the first place, so they don't look as full, but I've also had a lot of cuttings (30-40%?) fail at once when the weather turned colder here, because the soil was suddenly staying soaked for long periods.4 It's not such that I can't take more cuttings and go on with my life, but I'm not entirely sure that I want to: they revert to all-green pretty readily anyway, and I already have plenty of green Swedish ivy. This is, in any case, a really excellent beginners' plant: it's not difficult to keep alive, and it grows gratifyingly quickly when it's happy. I find it difficult to get excited about, but it's hard to find fault with it, either. 1 Among the others: Schefflera actinophylla and S. arboricola, and Araucaria bidwillii (monkey-puzzle tree Bunya pine, or bunya-bunya tree). It's not a long list, though. 2 Best example of this I can think of, which I either used at Pick a Plant or else really, really meant to use there: if I say "zebra plant" to you, you probably have a more or less immediate picture in your head of which species you expect me to be talking about. The trouble is, you have no way to know whether the zebra plant I'm talking about is the succulent Haworthia attenuata, the yellow-flowering Aphelandra squarrosa, the foliage plant Calathea zebrina (and to make that more ridiculous, the photo for C. zebrina at this site is a picture of Calathea ornata instead. Also, there is apparently a second Calathea, C. bella, called "zebra plant," so even if you get the genus right, we might still be talking about different species), the outdoor plant Sanchezia nobilis glaucophylla, or the bromeliad Aechmea chantinii. Even if you have a hard time with the scientific names, you should be able to see from this example why they're necessary. 3 Though I'm told that Tradescantia zebrina actually sells really well here in the spring, so maybe I'm going to find out that it's a hot retail item after all, in a few months. 4 A little baffling, actually, since the temperature and amount of light and so forth didn't really change that much: the plants just stopped taking up water one day, is what it looks like. I appreciate the concern (and for what it's worth, I would like to know if people run across my pictures or text elsewhere), but this falls within the Creative Commons license I use for pictures: it's not a commercial site as far as I can tell, and s/he attributed the picture by including a link back to my page. This does make me realize, though, that I should probably do something about my text, which I really don't want duplicated elsewhere. Time to edit the sidebar again. . . .
Oh, and hey -- even though it was a false alarm this time, I do appreciate you saying something. Better a false alarm than not knowing about it at all. If your variegated cuttings weren't doing well, it's probably because it's variegated. 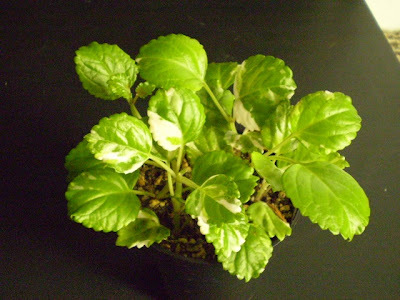 Variegated plants (of the artificial kind) commonly perform worse than nonvariegated conspecifics. No doubt it's because they're missing half their chlorophyll... I had both variegated and solid green Hoya carnosa in the same pot, and the solid Hoya easily outperformed the other, and only the solid green bloomed for me. It's weird to me that the variegated plants emit an odor when you brush your hands on the leaves and stems. Can't get the same odor by crushing the leaves. I didn't remember the green one doing that and was at the garden center this week and tested and they didn't. I had trouble being persuaded these were the same plants. The variegated I'm growing also has more hair on the leaves. Seems the difference is a bit more than just variegation here. What kind of odor? 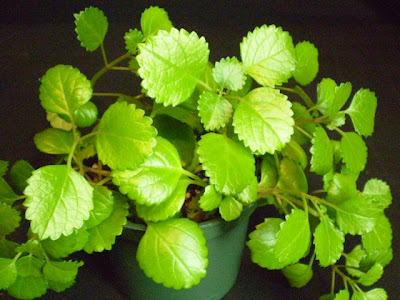 There are several Plectranthus species in cultivation, some of which have variegation that's a lot more stable than that of variegated P. verticillatus. 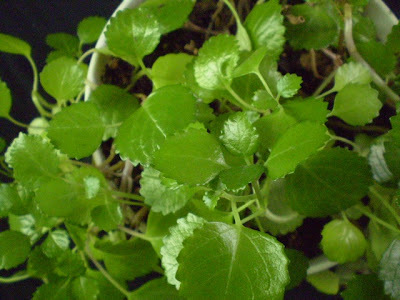 If the smell resembles oregano, you might have P. amboinicus. What kind of odor? I dunno. Sort of verbena-like maybe. I'm addicted to running my fingers through the foliage and then smelling of my hands! I'm just like some cats exposed to catnip. I could take a photo and send it to you if you're curious enough. It basically looks the same as your photo. The variegation is variable from almost two colors of green to near solid creamy white leaves, so always present but in an irregular pattern. The white tends to turn to appliance white as it ages, esp. the leaves that get more sun. I needed a plant to perform a growing function and it's doing that really well, but the odor is making me like it where I probably wouldn't be as fond of it otherwise, though I always appreciate a plant when it fulfills an intended purpose. Some pieces broken off by hail rooted easily in a pot outside filled with used potting soil. I googled images for P. amboinicus and the variegation on a lot of the photos isn't random enough, but other photos are very similar. I think the google images are perhaps not all the same plant and how do you tell for sure? The plain green doesn't have it, so if odor is a decisive factor then I possibly/probably have P. amboinicus. Hitting the plant with a spray of water can release the aroma if there's a bit of breeze and you're downwind. That's nice. Odd that when you crush a leaf it's just a piece of mangled green vegetation that smells...well, green...without the distinctive aroma. Hmmm. No, Google images are often not all of the plant you're looking for. I never noticed an odor, or any hairiness, on my variegated P. verticillatus, which makes me think you probably have something else, but I also haven't owned it in a very long time, so my memories aren't necessarily trustworthy. There are plenty of other scented Plectranthus species; P. amboinicus, P. oertendahlii, and P. verticillatus are the ones I'm most familiar with, but I sort of recall P. forsteri having a scent, and it's both often variegated and hairier than P. verticillatus. P. madagascariensis might fit also. I think forsteri is the more commonly sold of the two. Actually I'd just perused davesgarden before I found your blog. I meant to go back, but have been reading this blog since. I did again. If I had, really had, to choose from postings and comments on davesgarden it would be P. madagescariensis. All the photos look right, including the 'sport' that shows the green on green mentioned in my first note. But, frankly, it could also be amboinicus or coleoidus as shown and described there. That long trailing photo of coleoidus could be mine currently except mine has reached the ground and is running along that at the moment. Guess I should hope for amboinicus since it is apparently edible and this fall I could just chop it up and cook with it and not have to concern myself with overwintering it. this swedish i vy plant is a real pain in the arse, Seems almost snobby for the most part. It doesnt like full light and is doesnt like too little light. It has to be just right. Im ready to give this plant to a friend, or better yet a foe ! That has not been my experience at all. (I have seen them yellow from too much light, but there's a pretty wide range that's been acceptable for my plants.) Are you sure we're talking about the same plant? If so, is there possibly some other aspect of care that's causing your problem? Just thought I'd throw in that there does seem to be something called variegated swedish ivy that does have a scent. I just got a plant in the mail and when I opened the wrapping the scent hit me hard. I can't place the scent but it is similar to something I've smelled in the past. Maybe like lemon verbena as anonymous said since it is herbal and when I get really close and took a smell it did remind me a little of soap (and I do like lemon verbena soap). It is a Plectranthus (at least, it was listed as that) and it is not P. amboinicus or P. plectranthus forsteri marginatus as I have both and it smells nothing like them. Amboinicus smells really close to oregano and fosteri somewhat like mint to me. I'm going to have to do some looking around to see if I can figure out if it's verticillatus or another species. I thought I'd comment as when the scent hit me I was reminded of the comments here. I wish I could post a picture of what I have growing as a mystery plant. It's a bit more erect, but such similarities in pictures I've been looking at. Forgive for laymen terms here. The stems are red but the main veins in the leaves that are red are green. This species is the closets thing it relates to. This is the first page of yours I've read, and I want to say your writing voice is a rare pleasure in the plant care genre.